Thera-Band® Rocker and Wobble Boards offer an unstable and sensory-stimulating surface designed to facilitate balance and proprioceptive training and automatic postural reactions. The square Rocker Board and round Wobble Board provide the higher end of the Thera-Band System of Progressive Balance Training for rehab, post-rehab conditioning, and fitness applications. While the Rocker Board allows for one plane of instability at a time, the Wobble Board provides multiple planes of instability for the most challenging training. 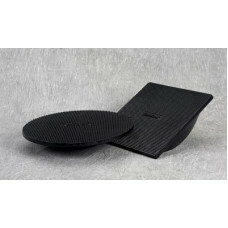 Both balance boards are made of black molded plastic with a specially-designed tactile surface on the top, and an anti-skid surface on the bottom. Each Rocker Board and Wobble Board comes with an illustrated instruction guide with over 37 exercises. In addition, balance training using these boards can be integrated with other resistance and balance products, including Thera-Band Resistance Bands and Tubing, Exercise Station, Soft Weights, and FlexBar® (each sold separately). Weight limit for each board is 300 lbs.